Sequins! Velvet! Satin! Tweed! This season, the catwalks were abundant with rich texture! We’ve translated this to nails through the infusion of glitter particles and metallic and holographic finishes. The colour tones speak to “earthiness” but are not specifically earth tones – think rust, shimmering greens and silvers. This collection feels future-forward but not futuristic. This season is all about using texture to add interest and depth to your look! Lovely Jubbly-(translation: excellent; used when a person hears great news or has a stroke of good luck) The lacquer is a vibrant magenta flecked with red, blue, and gold micro particles for a distinctly retro 70's feel. 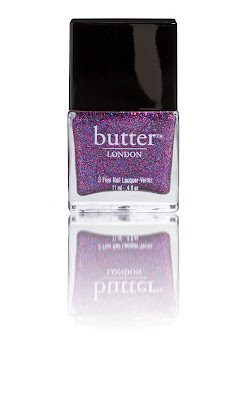 This sultry glitter gives high impact sparkle, perfect for even modern Disco Divas. Trustafarian- (translation: a spoiled rich kid who pretends to be a hippy, but still weekend's at Daddy's estate). 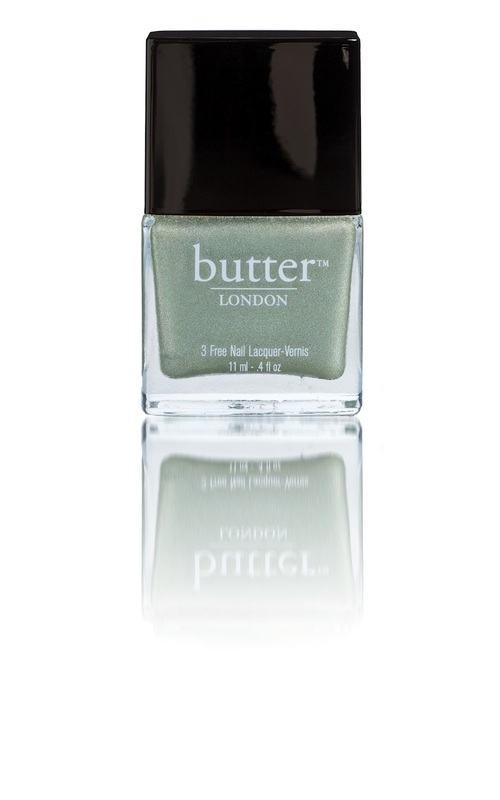 The lacquer is a delightful sage green with a golden holographic finish that gives it a surprisingly sophisticated edge. Gobsmacked- (translation: to be totally speechless or unable to think of anything to say). 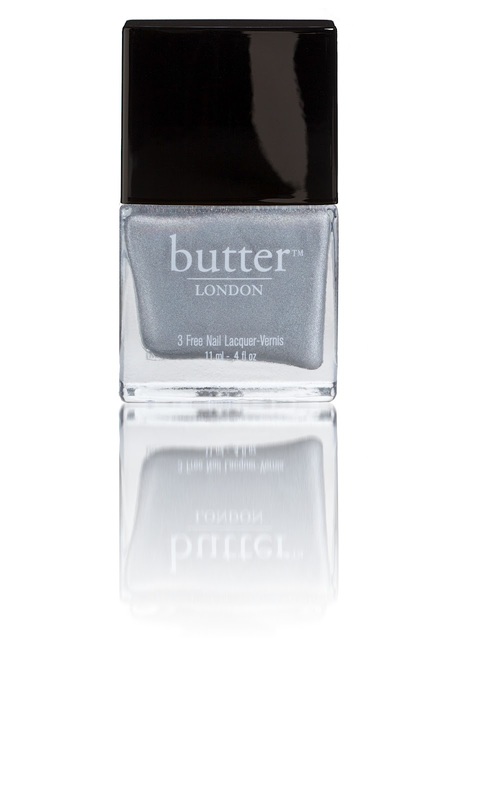 The lacquer is a heavily pigmented charcoal grey glitter with a slightly textured finish. It is a butter LONDON legend in the making and unlike anything seen before! Dodgy Barnett- (translation: a seriously bad hair cut or 'do; the mullet is the perfect example). The lacquer is a highly holographic shade that blurs the line between grey and silver. A must have! 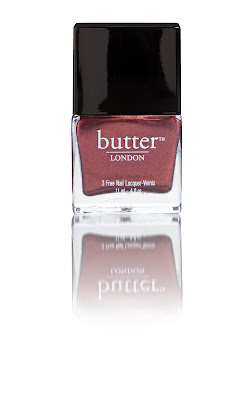 Backstage with butter LONDON: butter LONDON is a backstage staple at Fashion Week, having created the nail looks for shows including Victoria Beckham, Calvin Klein, Betsey Johnson, and Yigal Azrouel. Sought after for their innovative design, technique, and custom blended colours, this season the brand created the nail looks for Altuzarra, Kevork, Kaelen, Simone Rocha, JS Lee, Craig Lawrence, Matthew Williamson, Michael van der Ham, and Roland Mouret. Each Lacquer retails for $14 and they are available on butterLONDON.com and select Ulta Beauty stores.